With easy-to-follow drawing steps and an engaging story, Watch Me Read and Draw: Things Girls Love teaches kids to draw all their favourite things. It’s easy and fun to learn to draw - especially when you get to read a story too! 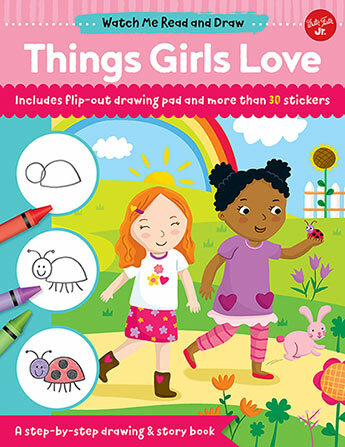 Learn how to draw all the things girls love, including a magical unicorn, a busy bee, a wise turtle, and a beautiful butterfly. Just follow the simple steps on each page to draw all of the characters in the story, one step at a time. There’s a flip-out drawing pad with prompts too, and plenty of stickers to make the story even more colourful! Jannie Ho is a children's illustrator, with work appearing in both trade and educational books, magazines, toys, crafts, and digital media. She received her BFA in Illustration at the Parsons School of Design in New York. After graduating, she worked as an in-house graphic designer at Nickelodeon, Scholastic, and an art director at TIME Magazine for Kids. In 2006, she left to pursue illustrating full-time and hasn't stopped drawing since! She is currently based out of Boston, MA.